When her black sheep brother disappears, Amanda Janvier eagerly takes in her sixteen year-old niece Tally. The girl is practically an orphan: motherless, and living with a father who raises Tally wherever he lands– in a Buick, a pizza joint, a horse farm–and regularly takes off on wild schemes. Amanda envisions that she, her husband Neil, and their two teenagers can offer the girl stability and a shot at a “normal” life, even though their own storybook lives are about to crumble. Seventeen-year-old Chase Janvier hasn’t seen his cousin in years, and other than a vague curiosity about her strange life, he doesn’t expect her arrival will affect him much–or interfere with his growing, disturbing interest in a long-ago house fire that plagues his dreams unbeknownst to anyone else. Tally and Chase bond as they interview two Holocaust survivors for a sociology project, and become startlingly aware that the whole family is grappling with hidden secrets, with the echoes of the past, and with the realization that ignoring tragic situations won’t make them go away. 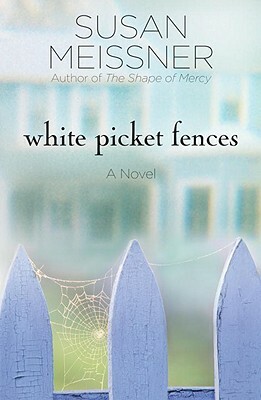 Will Tally’s presence blow apart their carefully-constructed world, knocking down the illusion of the white picket fence and reveal a hidden past that could destroy them all–or can she help them find the truth without losing each other? Susan Meissner cannot remember a time when she wasn’t driven to put her thoughts down on paper. Her novels include The Shape of Mercy, a Christian Book Award finalist, and Blue Heart Blessed. Susan and her husband, a pastor and a chaplain in the Air Force Reserves, make their home in Southern California. They are the parents of four grown children.